I'm developing a dashboard for hotel managament system application. 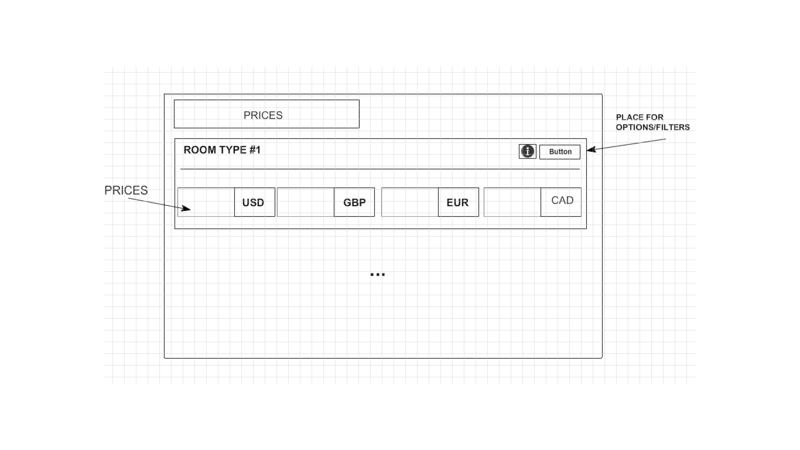 There's a view that allows the user to set prices for room types in different currencies. Sadly, I can't provide any screenshots as it's still in development. I don't really like the idea of placing multiple small inputs for each room type (Given 10 room types in a hotel with 10 available currencies, I would have to place 100 inputs). Unfortunately, prices can't be calculated automatically with exchange rates. I'd love to make this both self-evident and clean for the end user. In short - how to nicely present a large number of inputs so that the user doesn't get scared. If you need any more information or some quick mockup, please let me know. Any help much appreciated! Since having 100 inputs is unavoidable, I would do a 10 x 10 grid with each row alternating in colour. For example the row colours could alternate between white and a very light gray to give each row visual distinction, and so the user will not lose the row he is on. A different option to using alternating colours is to use line separators, like the https://ux.stackexchange.com/ homepage. Just make sure to give enough vertical spacing to keep the rows visually separated. If the user is at all technically savvy, they will most likely use tab key to skip from field to field, so making sure tabbing flows in a logical manner for the user would be key. Perhaps each room type could be calculated off a multiple of a base price? Base price = $100 USD. Base price = $95 AUD. This would allow the user to set a base price for each currency, which means they would only have to fill out 10 fields as opposed to 100. You would need another screen for them to change the base multipliers when the prices of rooms do change in relation to each other, but at least for the majority of the time, when currencies change they can far fewer fields, just 1 for each currency. I just realised a simpler way (for the user) of doing this. If you can have the 10 prices in USD set, the user could then just just manually punch in the exchange rate for the other 9 currencies, and your application could then calculate the prices based off that. I am making a big assumption that the hotel wants to directly convert the price from your native currency (which I've also assumed is USD), as using this method will not allow them to set unique prices for each currency. Not the answer you're looking for? Browse other questions tagged forms input data dashboard business-application or ask your own question. Has anyone had any experience with inputs similar to apple's calendar “create quick event”?